Freshen your breath and keep your smile bright without harsh abrasives or irritating chemicals. 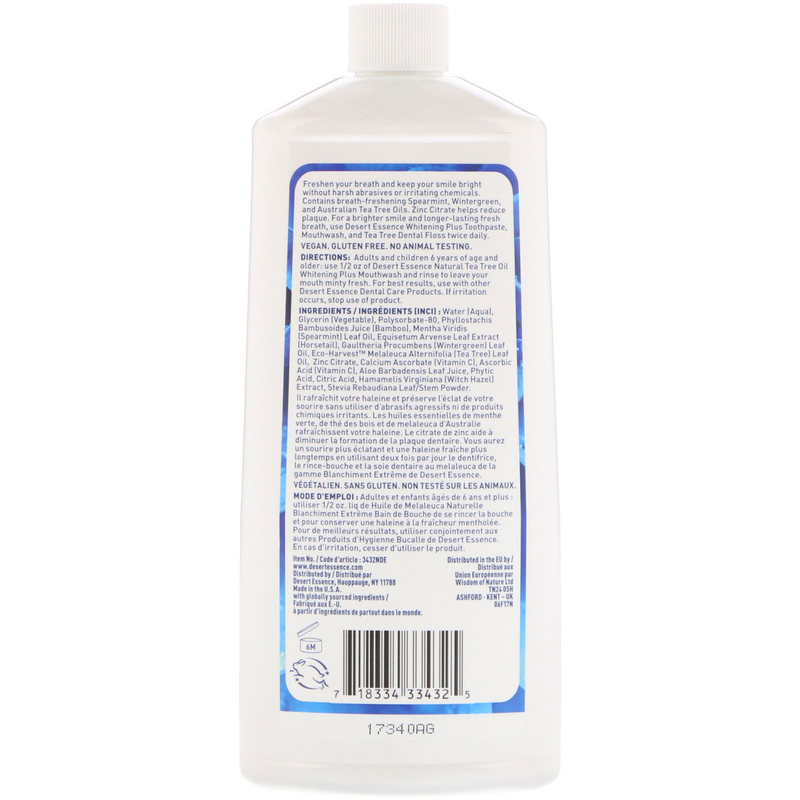 Contains breath-freshening Spearmint, Wintergreen, and Australian Tea Tree Oils. Zinc Citrate helps reduce plaque. For a brighter smile and longer-lasting fresh breath, use Desert Essence Whitening Plus Toothpaste, Mouthwash, and Tea Tree Dental Floss twice daily. 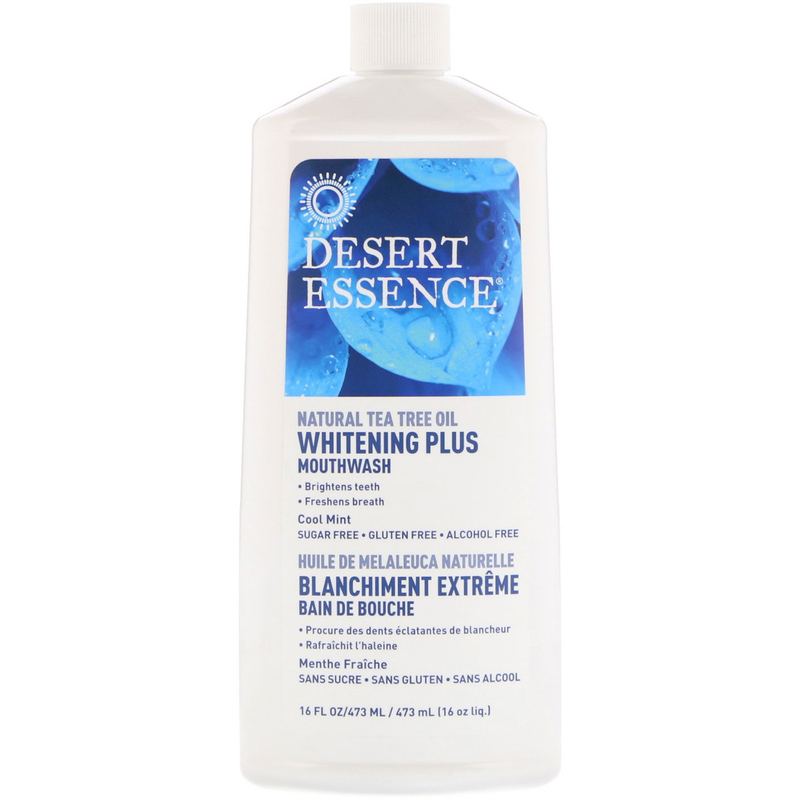 Adults and children 6 years of age and older: Use 1/2 oz of Desert Essence Natural Tea Tree Oil Whitening Plus Mouthwash and rinse to leave your mouth minty fresh. Water (aqua), glycerin (vegetable), polysorbate-80, phyllostachis bambusoides juice (bamboo), mentha viridis (spearmint) leaf oil, equisetum arvense leaf extract (horsetail), gaultheria procumbens (wintergreen) leaf oil, eco-harvest melaleuca alternifolia (tea tree) leaf oil, zinc citrate, calcium ascorbate (vitamin C), ascorbic acid (vitamin C), aloe barbadensis leaf juice, phytic acid, citric acid, hamamelis virginiana (witch hazel) extract, stevia rebaudiana leaf/stem powder. If irritation occurs, stop use of product.